Five fire crews attended a blaze which was started deliberately at the former Highways Hotel in Larne. The alarm was raised at the vacant Ballyhampton Road premises at 3.09 pm on Saturday afternoon. Fire fighters tackled a blaze on the first floor and roof space of the derelict building which took an hour-and-a-half to bring under control. Three fire crews from Larne were assisted by one from Whitehead Fire Station and one from Carrickfergus Fire Station. The incident was brought under control at 4.36 pm. 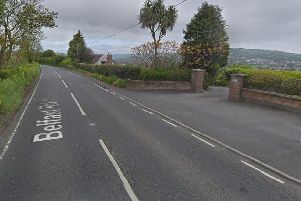 The Northern Ireland Fire and Rescue Service said that the fire was started deliberately. The 1.28 hectare site has lain empty since the doors of the hotel shut in 2010. A planning application has been made for the construction of 31 new homes at the location consisting of 28 semi-detached houses, one detached house and two bungalows.